I received my signed photos today. Our friend Cindy received her Summer Glau signed photo. 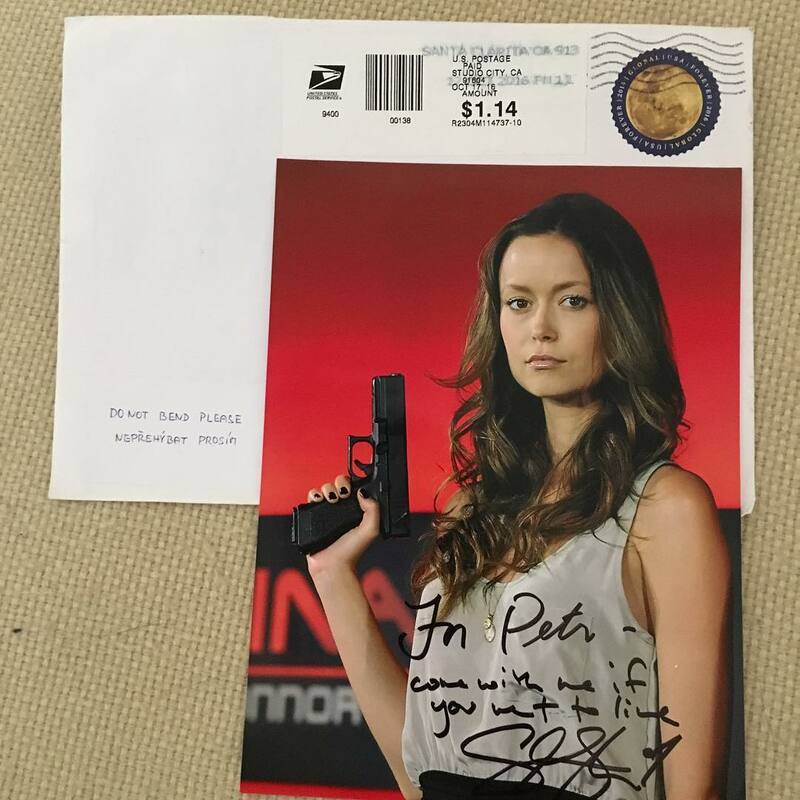 Our friend Mark received an answer to his fan letter to Summer Glau and kindly shared the lovely photos and note from Summer with us. Hey Chris my sister and I got our responses from Summer today, we wrote her last October and wow what a lovely reply we both got. Not many celebs would take the time to respond like this! Summer's answer is something that Mark and his sister will undoubtedly cherish for life. Michael received a letter and a signed photo from Summer in reply to a letter he send in 2009! There is my letter, please give me your opinion, oK? and admire you so much. We hope to see you again in other films. Since you asked, I think your letter needs improvement. You've got to make it more personal and mention why exactly you and Jacopo are fans of Summer. I suggest you mention as a first step the name of a few movies/TV shows you've seen Summer in, how you felt about Summer's performance, what touched your heart and spirit the most and how it changed your life. In a second step, you can mention that it would mean a lot for you and your friend if Summer could autograph and maybe write a dedication on the two photos you included. Saying in the first step why you love her will allow Summer to write in return a personal answer. Finally, and since English is not your mother tongue, I suggest that we help you write a letter in correct English. I am not good with words and I'm not English native either, but I'm sure other members of the site would be willing to help you. Ok, i will improve my letter with the names of some Summer's show and writing what I think of the performance of Summer in her show. Sent fan letter requesting autograph with self-addressed envelope and IRCs in September 2010. Received a signed 8×10 photo, personalized as I requested, on 2011/11/08 mailed from Los Angeles, California, USA. Daniel send a letter to Summer 9 months ago using her fan mail address and just got a reply. FANTASTIC!!! I've just Summer Glau's autograph in the mail! I hope she goes to ARMAGEDDON EXPO in Wellington someday. I really would like to go and thank her personally. Thank you, Summer. Hasta La Vista, Baby! I have send a letter and photo to Summer a couple of months ago. Now I know that she will get a lot of fan mail, I'm not getting worried because I know that it will take time, but I know that Summer cares a lot for her fans and she will do everything to make her fans happy. But do you think that she answer all her fanmail, or maybe she don't answer to everyone. You know that there are so many story's about other celebrities, mostly those A-star celebrities that never answer any fanmail. That is something I don't understand. If I was a celebrities I would love to hear from my fans and I would be happy to send them autographed pictures. But do you think that she answer all her fanmail, or maybe she don't answer to everyone. From my understanding, Summer answers "in waves". For example she can decide to spend a weekend answering her fan mail. Be patient! It seems a number of fans have received an autographed photo of Summer these days, confirming that Summer answers fan letters "in waves". The letters were send a while back (more than a year ago for some) and unfortunately the P.O. Box used is no longer valid. A new fan mail address will be set up in the near future. Of course, we will let you know as soon as the new one is ready. Petr got mail! For the record, he send his autograph request on January 2016. Kazuki got mail! For the record, he send his autograph request about one year ago.